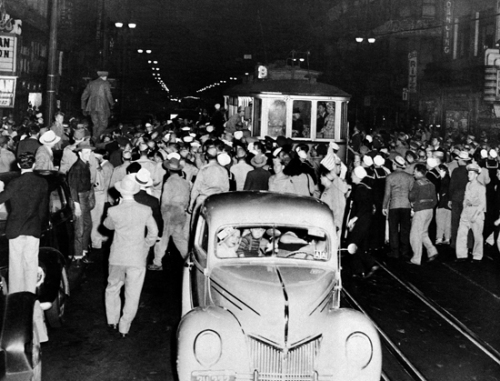 The Zoot Suit Riots (1943) took place in Los Angeles and lasted for about a week. It started out as fighting between White US servicemen and pachucos, Mexican Americans who wore zoot suits. But soon Mexican, Black and Filipino Americans were being beat up whether they wore zoot suits or not. And Whites, some of them off-duty policemen, were helping the servicemen. Amazingly, no one was killed. Zoot suits had a long jacket, wide lapels and baggy trousers with tight cuffs (pictured below). They were sometimes worn with a long chain and a wide-brimmed hat. It was a Black American fashion that soon became a Mexican American one. 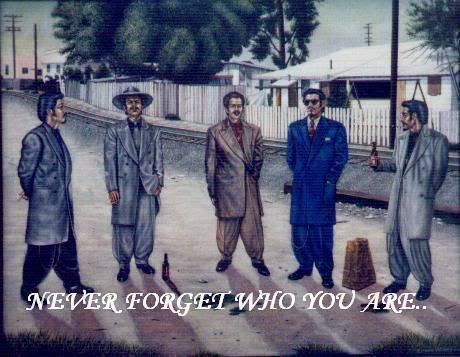 Pachucos were Mexican Americans who wore zoot suits, listened to jazz, had their own slang, hairstyles, dances and so on. Their female counterparts were pachucas. Like many youth subcultures, it offered them an oppositional identity counter to their (square Mexican) parents and the (racist Anglo American) mainstream.